Halloween was originally called All Hallows’ Eve, a pagan holiday when dead ancestors were remembered. This tradition became a cultural phenomenon and is now celebrated in many different ways by people from all around the world. Businesses see Halloween as an opportunity to grow in their revenue before the end of the year from the sale of candy and services to customers. Others view this holiday as a fun-filled sugar high for kids in cute costumes. Concerned parents perceive Halloween as an evil holiday that focuses on the occult, devils, and worship of all things dark and demonic. Whatever your position is, don’t let the opportunity for a conversation about the spiritual dimension and eternal life slip by. 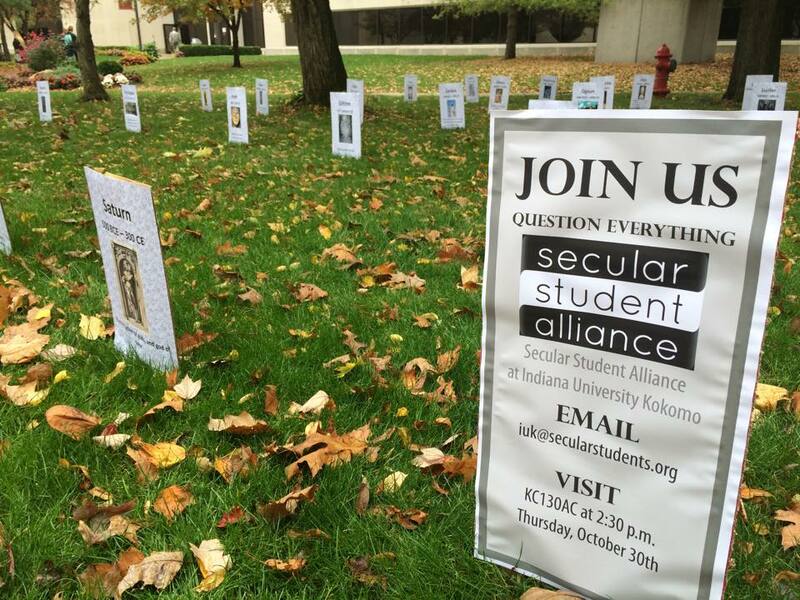 Last week, the Secular Student Alliance–an educational non-profit organization for Atheists, planted tombstones in the lawn at our local college university. They called it Graveyard of the gods. It featured a number of ancient gods like Zeus, Osiris, and Saturn who are considered mythological today. It also raised an important question: What’s stopping Allah and Yahweh from joining the mix? This frightful display on campus ironically led to a constructive conversation between Atheists and Christians. For instance, one Atheist said it was only a matter of time before Jesus and other self-proclaiming gods will cease to exist. The Christian rebutted this false accusation with two points. First, he demonstrated that Yahweh has existed much longer than the Egyptian, Roman and Greek gods, as well as Islam. Therefore, the notion that the God of the Bible will come and go like fads or trends is not a historically accurate statement. The Christian contended 7 proofs for the resurrection: empty tomb of Jesus, eyewitness testimony from women, Jesus’ Apostles’ new found courage, changed lives of James and others, a large crowd of eyewitnesses, the conversion of Saul of Tarsus, and the disciples dying for Jesus. Though the Atheist was not convinced, the discussion still led to a positive experience and there was a greater appreciation for belief in the Christian religion, spirituality, and the afterlife. You have heard the saying, “When life gives you lemons, make lemonade.” I see Halloween as an opportunity to speak to non-Christians about death, the afterlife, demons, and God because people are looking for more than just candy and a good time. They are on a quest to find answers to life’s most important questions, and as Christians, we have the hope they are looking for! What did Jesus instruct us to do in Matthew 5:15? Next year, I want to challenge you to share your faith in Jesus Christ to the outcasts, broken-hearted, pagans, common folk, and the sinners and tax collectors. Don’t turn your lights off and hide from the people. Instead, combat spiritual warfare and turn lemons into lemonade. Give candy and put a gospel tract in there. Preach the gospel on the public sidewalk. Challenge them to the “good person challenge if you want. Here is a video below that helps you to do that. Whatever you do, give a defense for the gospel, doing it with love and respect. God bless!